This past Labor Day weekend, I was on the faculty of an event directed by my friend Jim Donovan, called "The Great Rhythm Revival" which took place in rural western New York on the same site where the Great Blue Heron Music Festival is held. 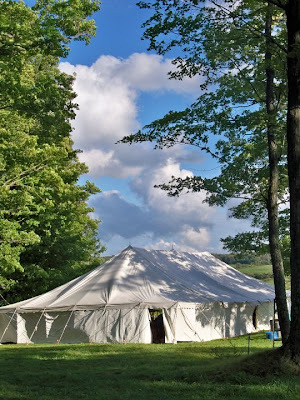 It included drumming, dance, and personal growth workshops all held under a huge festival tent in the middle of nowhere. It was for me, a life changing experience in about 100 different ways. Camping for the 1st time in 14 years while weathering a hurricane in a borrowed tent... (Thank you Earl!) Playing onstage with some of my best friends and favorite musicians in what to me was the Best. Jam. Ever. Rain and wind beating at the sides of the tent while the music played & people danced.. so very surreal. Teaching people to make mandalas in the dining tent... Seeing the Milky Way for the 1st time. Eating some of the best food ever - so good in fact, I hugged the chef. Crazy bonfire in the middle of the woods, faerie lights strung about and a big blue peace symbol watching over it all. Meeting back up with some of my best friends, making new friends.... I just can't say enough about how wonderful this experience was. In the center of it all is my friend Jim Donovan who got his old-fashioned tent revival in the grandest of ways. After working with Jim for going on 6 years, I know that if his name is on an event, it's going to be spectacular. I can't wait until next year. Photo of the Revival Tent courtesy of the amazing Jessica MacIntyre. This is one of my new friends I met while on my recent extended stay in western New York. Her name is Miss Liv and she is two years old. My friend Jen was babysitting for her while I was staying at her house. Jen and Liv had just arrived back at the house after a bit of shopping, as you can see by the carton of farm fresh eggs sitting next to Liv on the counter. My, oh my! I have never seen such large eggs, or eggs in such pretty colors! Apparently Miss Liv was also enchanted by their beauty because one by one, she would select an egg, delicately turn it around in her hand, then place it back in the carton and select another. Meanwhile, I am losing my mind. As I have no children and rather limited experiences with them, the voice inside my head is screaming, "Take the raw eggs away from the two-year old! She will likely throw them to the floor and create such a mess! Oh for the love of sweet Nick, please take the eeeeggggggggsssss away from the CHILD!!!!" Why? Because Miss Liv isn't my child, and this isn't my house. A fierce battle is raging on in my head over whether or not I should say something to Jen, (who is just out of camera range in the image above) how I think this is a bad idea- but Jen seems to be an amazing mother to her own 8 year old and though I don't know her all that well, my gut wins and says "Trust her. What's the worst that can happen? A broken egg??? Then you clean it up." 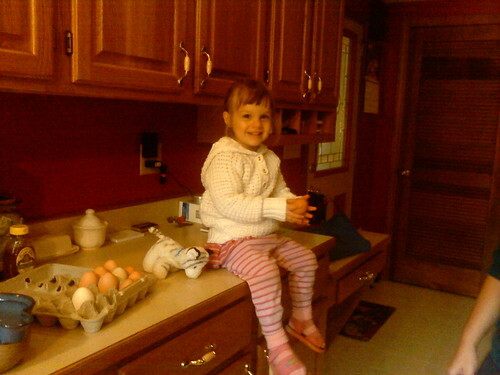 So I watch Miss Liv continue to play with the eggs. The fear is leaving my body. My urge to control the situation is hasta la vista. I am so PROUD of myself for trusting in the moment because I felt that there was something to learn from this situation. "SPLAT!" Right to the floor. It simply did not make the transfer from one hand to another. I am proud to say that one part of my head must have been sitting and smothering the other because I never for a second heard "I TOLD you so!" I simply looked at the egg and said to Jen, "I guess that's the worst that could happen!" and we both laughed. Took about 30 seconds to clean up the egg but that moment (and lesson) will live forever in my memory. But I really wanted to read it, thought about buying the new paperback version to try and get back into it but when I saw it at the store, well, it was just as big, bulky & heavy. Sigh. So I started thinking Kindle even though I simply adore the way a book feels and smells in my hands. Digital content frustrates me in that you have nothing but to hit delete if you don't want it any more. Nothing to swap at the local used bookstore or to set out at the next neighborhood yard sale. 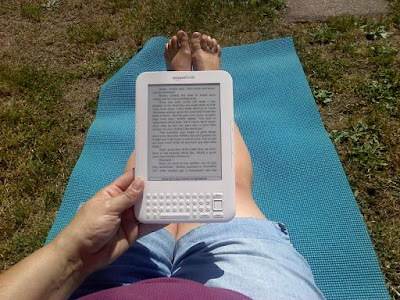 eBook readers just seem so cold & lifeless- but I really wanted to read that book and I thought maybe a Kindle would be good for catching up on a lot of the good fiction I'd been missing over the years. So I took the rewards from my Amazon credit card & I bought myself a shiny new 3rd generation Kindle. In white. 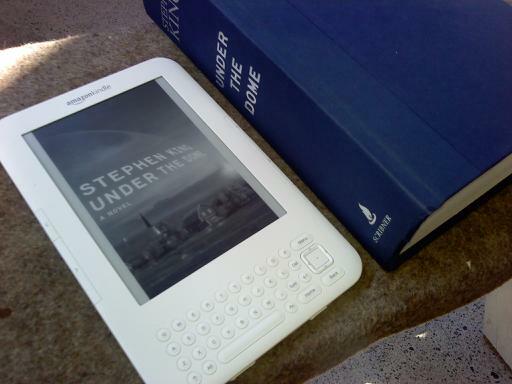 And before it even arrived, I had bought Under the Dome, and also a short story that Stephen had written called "UR." The day the Kindle arrived I powered it up, grabbed a yoga mat and sat out in the sun and decided to read the short story first. It was about a man who buys a Kindle and finds out that it has the special ability to download books from ten million different alternative realities- which means additional books by your favorite authors, The story was really good until I got towards the end where Stephen used the term, "low men in yellow coats." And that's when I started to cry over my Kindle. To me, one of Stephen's most endearing writing habits is to weave small repeated elements throughout seemingly unrelated books. So here I was, sitting and reading on this Jetson's-like device in my back yard and that one little phrase knocked me for a tail spin. With new technology, I think it is common to think about what "new" things you can do and access with it, but I'm not sure we ever really think about the way you can sometimes go backwards. Take YouTube for example. It's fun to watch the latest viral video, but I can get lost for hours watching old commercials from the 1970's. It becomes this portal into the past that seems to validate that I was alive during that time - that it wasn't just part of my own memories, it was REAL. One my all-time favorite King books. I click "buy" and it shows up on the home screen in less than a minute. 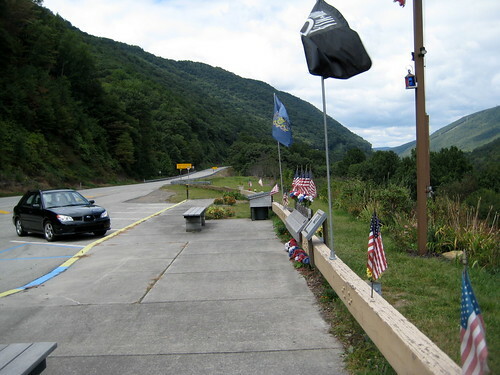 "On September 15th, 1981, a boy named Jack Sawyer stood where the water and land come together, hand in his pockets of his jeans, looking out at the steady Atlantic." I absolutely love my new Kindle. I love that I can highlight and save favorite passages on the fly - ahhh.... it's just so good. And I have always said, it doesn't matter what your reading, as long as your reading. 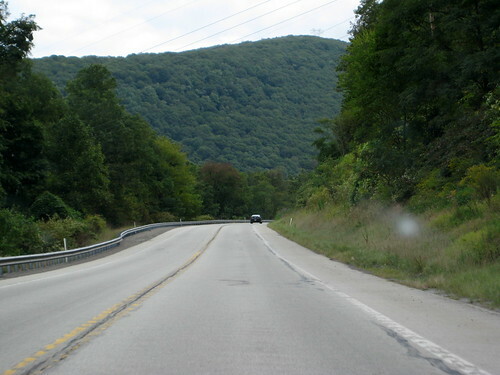 Minding my own business, just driving along on my way to visit my friend Becky in Johnstown, PA and jamming to the song "Marvin Gaye" from the Basement Rhumba CD by my friends Bryan Fazio & PJ Roduta, I see the view above. (Please ignore the bug splat on my windshield.) I start to get excited because on the right hand of the state where I am from, we don't really have such dramatic views such as this. 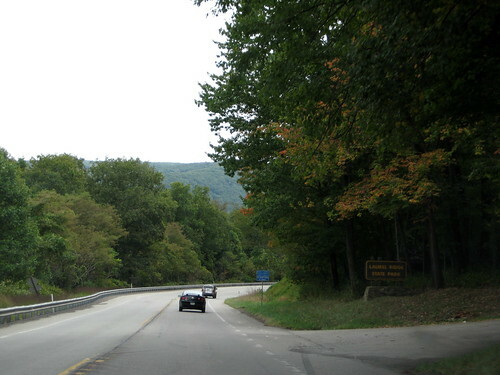 As I tend to be a "let's just get there" kind of person, I almost never pull over to look at the view but I happened to notice a sign that specifically said, "Scenic Lookout" and so I broke tradition and pulled over. I thought the view in front of me was amazing but when I turned around, you could have knocked me over with a feather. How awesome is that? To me, it will prove to be a constant reminder to pull the heck over & see where you are! Someday soon I will drive to Portland Oregon and see even more majestic scenery! This is my friend Alex who I know from Jim Donovan's Summer Rhythm Renewal retreats in Loretto, PA. (He's a drummer like me.) One day on Facebook, he asked me when I might be back in the Loretto area. 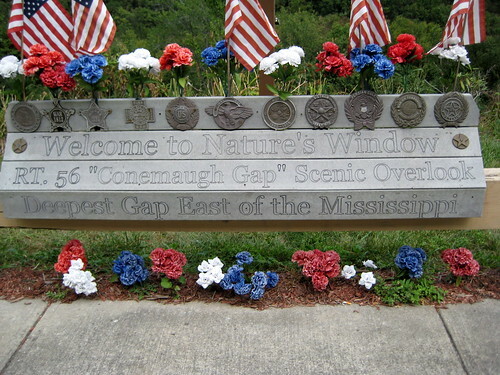 (About 4 hours away from me.) 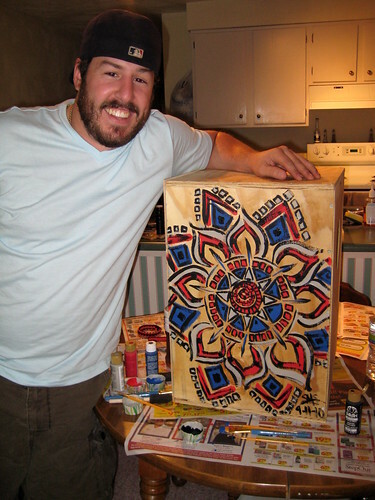 When I asked why, he told me that he had made a cajon drum and would I be interested in painting a mandala on it for him? He got the idea from when I wrote about the pole I painted for my friend Jaqui MacMillan. 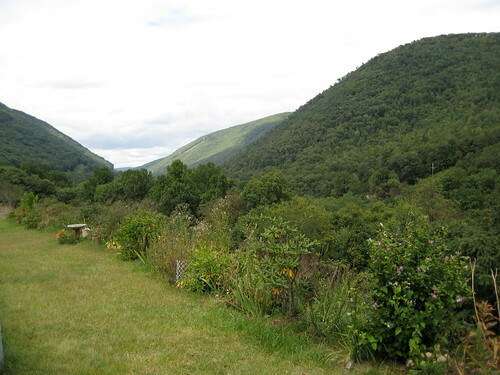 Two weeks ago I left for Jim D's Great Rhythm Revival in Sherman, New York. After spending 4 days at the Revival, I went and visited with new friends near Findley Lake for 5 more days, then drove to Johnstown to visit with another friend. Realizing that Johnstown is about an hour away from Loretto, I called Alex & told him I was in town and would be happy to paint his new drum if he was still interested. 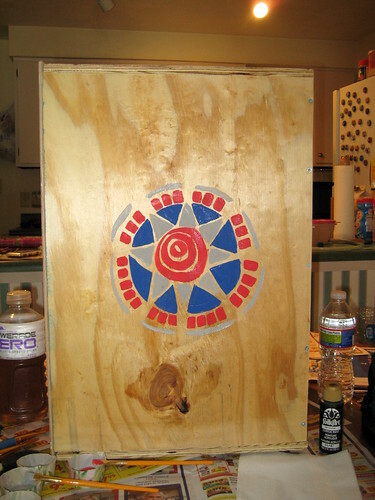 This is where I started - on the left side of the drum. Made out of plywood, Alex found the instructions on a site called Instructables. As usual, I have no design in mind. No plan... I just pick up a brush and start to paint. 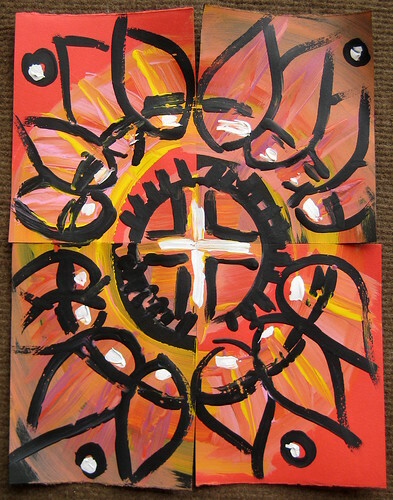 We are using inexpensive opaque acrylic craft paints. They cover the wood quite well. 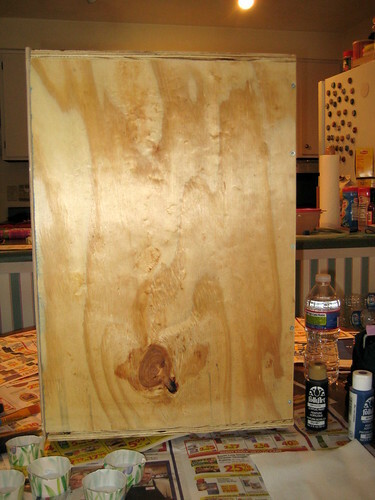 I contemplated painting the background, then decided it would be cool for the wood to peek through. 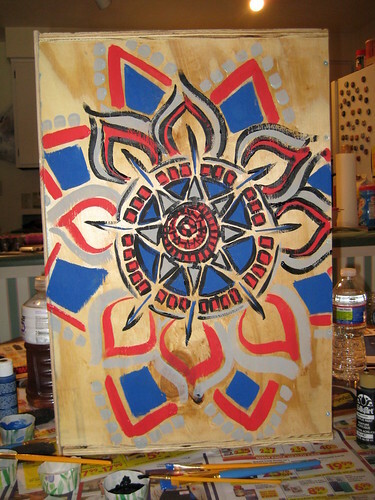 The colors I used were royal blue, red, gray & black. This is how far I took it before deciding to add a black outline over top. I am a much bigger fan of adding black over top of a painting, than outlining with it and painting it in. I think it looks much more organic & loose this way. Once again, the final product. Alex was quite pleased. I suggested that he paint one of his own on the other side, since he learned to make them earlier this summer in my mandala workshop at the retreat. Can't wait to see how it turns out! 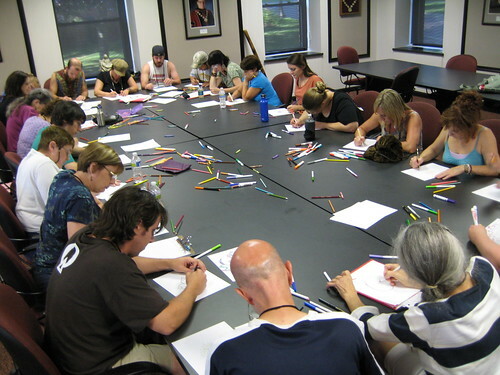 Mandala workshop in Loretto. Alex is in the back with his cap turned backwards. I don't know why Jean-Michel Basquiat came to mind as I was creating this piece, but he did. I'm not very familiar with his body of work but something in me pulled to use the black gesso on top of this piece and as I did I couldn't help but think, "Basquiat." Often when I work, I don't have a set plan for what I am about to do. 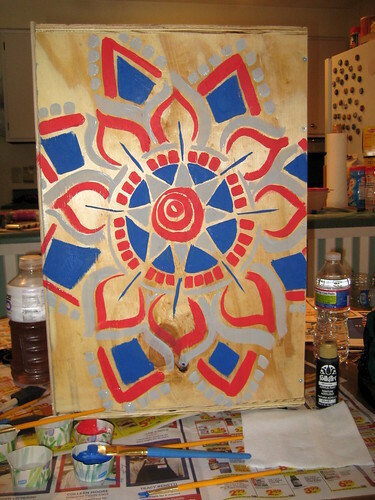 In this case, I was working with acrylic paints and was trying to use up the remaining paint I had poured out. I had a few small cut/torn pieces of Canson paper and decided to try taping them together and then creating as a whole... maybe later I will remove the tape and display them in a different way.